The Knower and the Known: Physicalism, Dualism, and the Nature of Intelligibility - Printed from the www.epsociety.org web site. 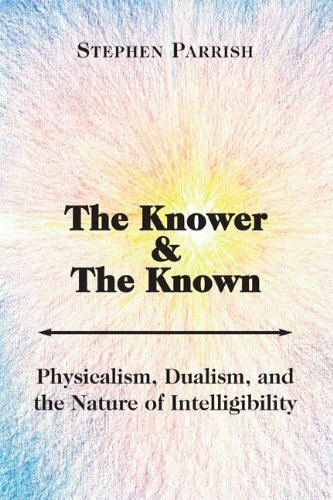 The Knower and the Known: Physicalism, Dualism, and the Nature of Intelligibility (St. Augustine's Press, 2013) argues that reality is understandable and is explicable by the proposition that consciousness is ontologically more fundamental than the physical. It argues at length that no physicalist theory of the mind can succeed. Although body and consciousness are intimately woven together, for knowledge to be possible, consciousness must be founded on immaterial selves. Abstracta such as universals are real, but are best understood not as independent entities but as ideal objects in the mind of God. Read an EPS interview with Stephen Parrish about his book! It deals with some of the most controversial subjects in philosophy today: the relation of the mind and the body, the fundamental nature of the physical world, the existence of abstract entities, and the nature of knowledge and its relationship to human consciousness. It engages both the insights of contemporary analytic philosophy of mind and phenomenology. It argues at length that no physicalist theory of the mind can succeed. It is integrative: it offers understanding of the different parts of reality by how it brings them together into a coherent account. External reality is understandable because it is the product of God’s mind, and human beings can grasp that intelligibility, both in physical reality and abstractly, because our minds are finite analogs of the divine mind. Enjoy Chapter 9 of The Knower and the Known, which is perhaps one of the more unique aspects of this book's argument!